For all you fellow lasagne lovers, this one if for you. Join the club! This little concoction never fails to impress and leave you wanting more. It takes around an hour and a half to make, and only half an hour ish to cook but by golly is it worth it! So, enough rambling. Let's get started! Chop the onion, celery, courgettes, garlic, thyme, chicken and basil. Get a big pan, place it on the hob and turn it on a Medium - High heat. Add 2 - 3 Tablespoons of your chosen oil. Then after heated, add the Courgette, Onion, Celery and Garlic. Leave that to reduce for about 5 minutes until it has all softened. 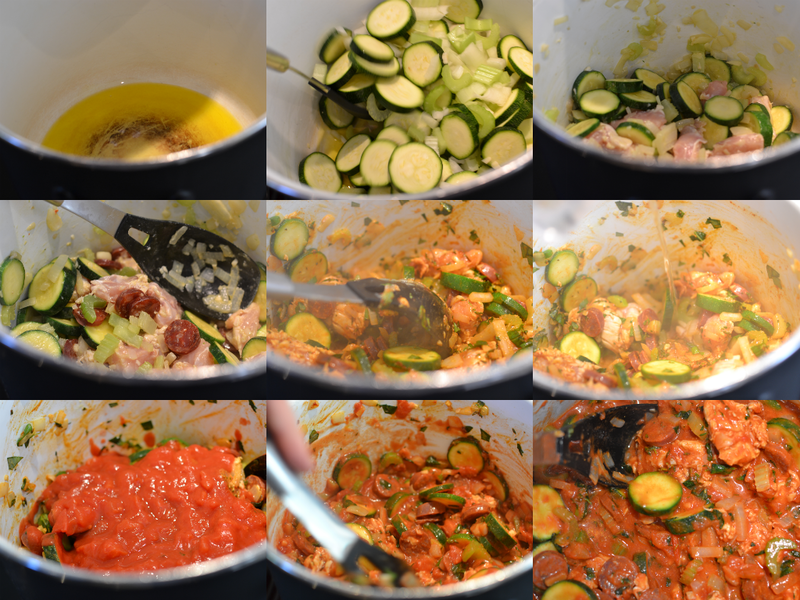 Once it has all softened, add the Chopped Chicken, Chorizo, Thyme, Basil, Paprika and White Wine. Then shortly after add your tins of Chopped Tomatoes. Give it a good stir, leave to reduce for about 15 minutes. After reduced, add the Caster Sugar and Seasoning. We need to now make the Bechamel / White Sauce. You will need your Butter, Plain Flour, Milk and Nutmeg. Firstly, gently melt the Butter in a saucepan. Then after the Butter has melted, add the Flour and Nutmeg. Keep whisking until it has turned into a paste. Once it is a paste, you need to gradually add bits of milk. Then season. This is the fun part, laying out the lasagne. First chop up your Mozzarella before you start. Now, line out your 30W x 20L x 10D ovenproof dish with a bottom layer of Tomato Passata and your choice of oil. Then simply follow the steps below, ensuring that all layers are spread out evenly and the sauce covers the edges of the lasagne (gently press the lasagne sheets down). Place in oven at 190c for 30 - 40 minutes until the toping is golden and slightly crispy! Enjoy and be sure to send me pictures of yours if you make it!